You are currently browsing the tag archive for the ‘indigenous women’ tag. 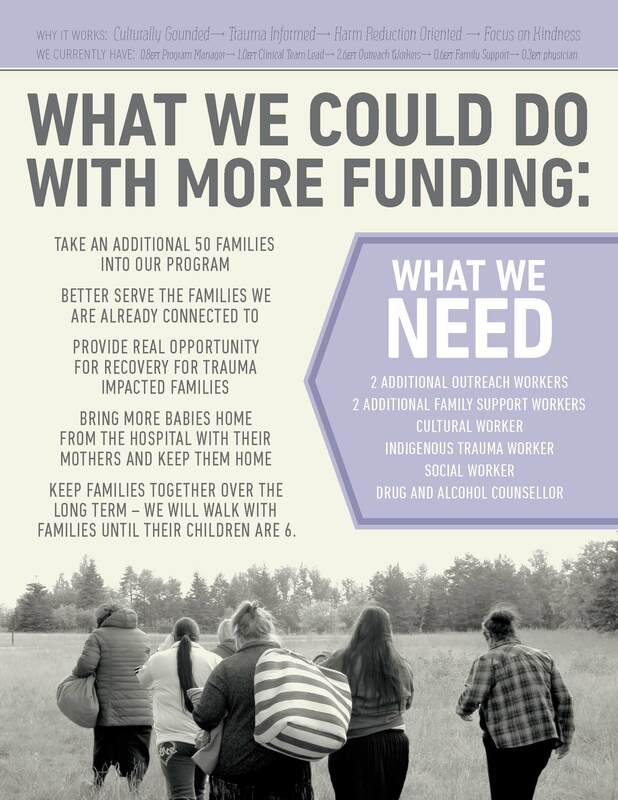 Manito Ikwe Kagiikwe (The Mothering Project), located at Mount Carmel Clinic in Winnipeg’s North End, provides prenatal care, parenting and child development support, group programming, advocacy, and addiction support for vulnerable pregnant women and new mothers. CBC News interviewed Stephanie Wesley and Margaret Bryans about the program earlier this week. Bryans, a nurse and program manager at Manito Ikwe Kagiikwe, discusses the successes of the program since it first opened two years ago. The article focuses on the importance of supportive relationships and the value of a ‘focus on kindness’: “Women who are pregnant, who are using drugs and alcohol are one of the most stigmatized groups in our community.” (The Mothering Project aims to break cycle of addiction, CBC News, April 28, 2015). The program is a wonderful example of a integrated and holistic pregnancy program for women with addiction and related concerns. The program is based on principles of harm reduction. (Learn more about harm reduction and similar programs in this booklet, Harm Reduction and Pregnancy: Community-based Approaches to Prenatal Substance Use in Western Canada). Since the program opened two years ago, 49 women have participated. 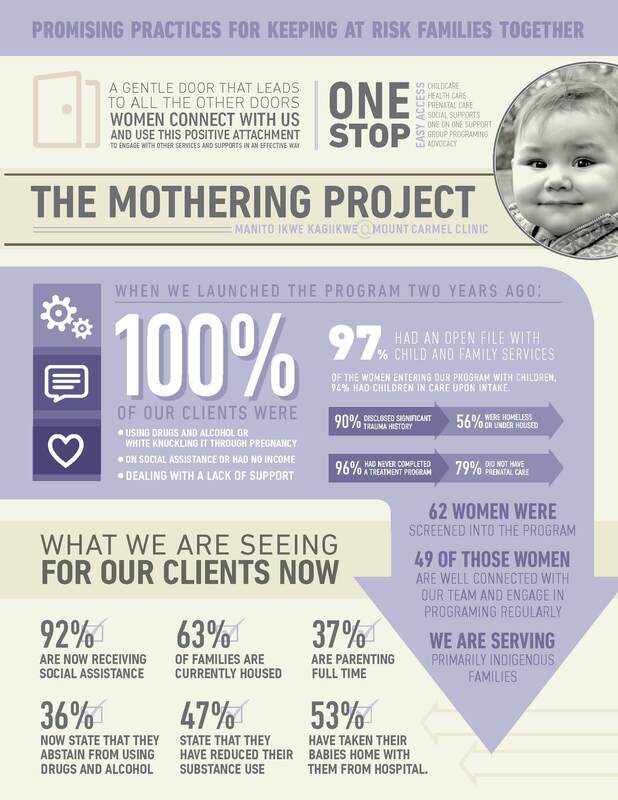 Early evaluation findings show that, at the beginning of the program, 100% of women were actively using substances, 97% had never completed a substance use treatment program and 56% did not have a prenatal health care provider. Over the course of the program, 36% stopped using alcohol and drugs, 47% reduced their use, 39% attended an addiction treatment facility and 100% accessed prenatal care. Over half of mothers have been able to take their babies home with them from the hospital. Check out the infographic below for more. First Peoples Worldwide is an international organization dedicated to promoting Indigenous economic determination and strengthening Indigenous communities through asset control and the dissemination of knowledge. Britnae Purdy recently wrote an article on the organization’s blog called “Alcoholism, Fetal Alcohol Syndrome, and the Native American Woman” (August 14, 2014). The article discusses the introduction of alcohol in Native American communities, the prevalence of alcohol misuse in certain communities, the causes and effects of FASD, and approaches to intervention. The article ends with a call for action and suggests some of the unique ways Native American women can be involved in supporting the health of their communities and preventing FASD.